For the first post of 2011 I chose a dessert from our new year's eve table. For various good reasons we didn't host a big new year's eve party this year, and instead had a quiet (and still lovely) evening with good friends living nearby. We were 6 adults (including one Swede), 1 schoolgirl and our little daughter. We shared a feast of cold cuts, some American and Swedish lobsters and, a layered beetroot and salmon salad, and a bit of this and that - all delicious. I was asked to contribute something sweet. I didn't want to bake a cake - exhausted from all the Christmas baking, I guess - and then decided to bring two desserts instead. Both of them were inspired by a Swedish food magazine Lantliv Mat & Vin (4/2010) that K. had recently brought back from a business trip to Stockholm. One of dishes was poached pears in a vanilla and ginger syrup, the other was clementines macerated in a spiced white wine syrup. I didn't want to open another bottle of wine, and had an half-empty vermuth bottle on hand instead, so I adapted the Swedish recipe accordingly (drastically reducing the amount of sugar, to start with!). I loved the result - slightly spiced, slightly sweet - and a very pleasent new way of serving the clementines/mandarines that are sold everywhere at the moment. First, prepare the syryp. Measure the vermut and water to the saucepan, add star anise and cinnamon sticks. Bring to the boil, then reduce heat and simmer gently for 10 minutes. Meanwhile, peel the citrus fruit, removing all the white pith carefully (I had small Moroccan clementines - a bother to peel, but at least there was no pith to remove). 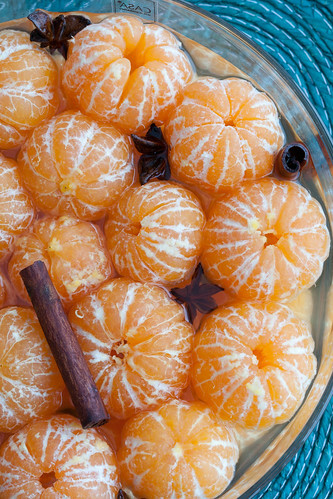 Place the mandarines/clementines into a heavy glass jar or bowl, fitting them tightly next to one another. Pour over the syrup (slightly cooled), so all the fruit would be covered. Leave to macerate/season for a few hours. Oh Pille, HUGE congrats on the book and good luck with the soon to be two under two! It's been ages since I've visited here, hoping to rectify that in 2011!! Oh, looks so colorful and awesome. =) Can I use imported Indian mandarins for this? Also - Pille, do you know any good cafes and coffee shops in Edinburgh? What a gorgeous blog and so many fantastic recipes! I look forward to getting stuck in!! Will bookmark and return! Must-must-must make this! You and your gorgeous citrus!